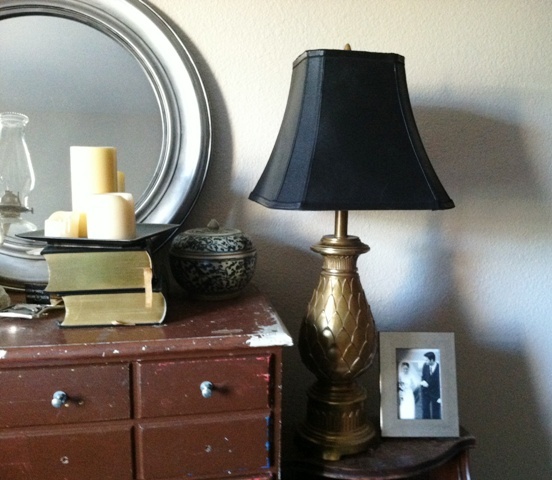 Remember my great thrift store find, Old Brassy? He needed a lampshade, and this past weekend I found one that was the right size, the right shape, and the right price… $5.99 at TJ Maxx. Alas, it was not the right color. I’d already decided I wanted a black lampshade to keep His Brassiness on this side of fresh, and a few Google searches and store browses later, it became clear that for the price I was willing to pay I would have to transform a white or beige shade with my DIY craftiness. I was OK with that. Not wanting to reinvent the wheel, I browsed the lampshade tranformations of other bloggers before me. Recovering with cloth seemed like the most bulletproof method, but I was working with a square shade with cut corners. Unfortunately you can’t just wrap some fabric around that like you could with a drum shade, so I checked out the spray paint method. I knew that the trick with painting a lampshade, especially in a dark color, was going to be keeping it from looking blotchy when the light was on. – Don’t start spraying directly at the fabric, to avoid round blotches. Start by pointing away from the project and bring the mist over to it. – Do light coats from far away – 12″-18″. You may lose some paint to the air but your coats will be more diffused and end up more even. I bought some fancy automotive spray paint that was satin black and made for vinyl. I liked the low satin sheen and figured this brand was more likely to bond to a synthetic (plastic-based) fabric and still remain flexible. Also it had a high quality sprayer that I knew wouldn’t spatter at any point in the process. However, I’m sure most regular spray paint would work well too. And so I began. 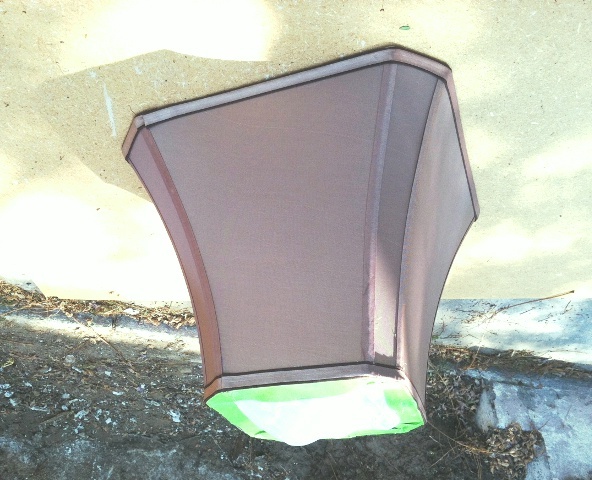 I took my shade outside and carefully taped off the top. Here I am speculating whether this crazy paint project is going to work, and hoping I’m not about to waste $15 between the shade and the paint and end up with an ugly, useless lampshade. Looking good!! Nearly there. I gave it a couple more coats, let it dry to the touch, and brought it inside to test on the lamp with the light on. How handsome is the black/brass combination? Very, that’s how. And now for the moment of truth… let’s turn on the light. 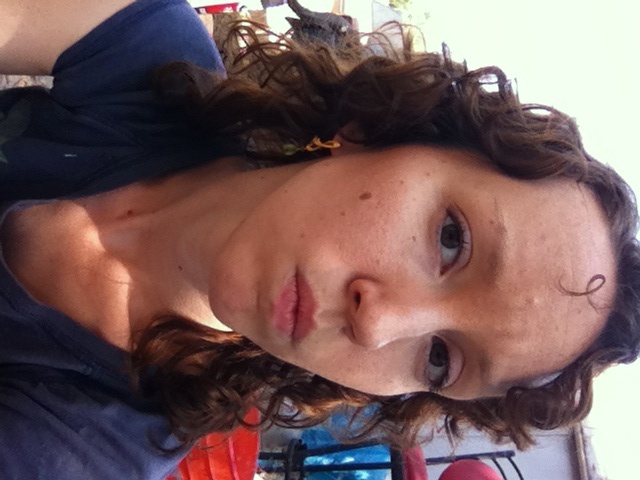 Hm… not terrible… but not quite where it needed to be either. Two sides were fairly evenly coated but needed more paint, and two sides had big dark blotches despite my best efforts at evenness. The original fabric had some texture that did not disappear, kind of like veins in a rock or something, and I could tell this would actually help the slight unevenness of the spray paint be not so glaring. I took it back out for the last 1/3 of the bottle of spray paint, marking with bits of tape which areas needed or didn’t need more paint, in hopes of keeping things even on this last step. The end result was better than I expected after the blotches of the first try. The whole shade got a lot more opaque with the light on after the final coats of paint, which is what I wanted. I still had two sides that were fairly evenly coated, and that was enough to keep it looking good in the spot it will live. I could fudge it so that the two sides that had shiny spots where the paint got too thick were not too noticeable. A little light still came through the shade, especially where there were striations in the fabric, but it mostly looked intentional. Oh, and it looks Really Excellent with the light off. The moral of the story is that it’s very, very difficult to put a coat of spray paint on something so evenly that it still looks amazing when it’s backlit :) I wonder if I could have covered the panels with fabric, using a paper template to get the shape right, then used trim where they met at the edges? That’s probably what I’ll try next time I have a shade like this if I want to change. 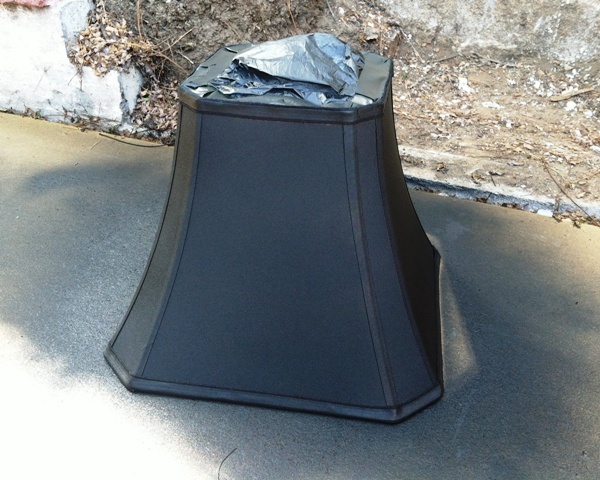 But if you ever considered spray painting a lampshade black, now you know how it will go! 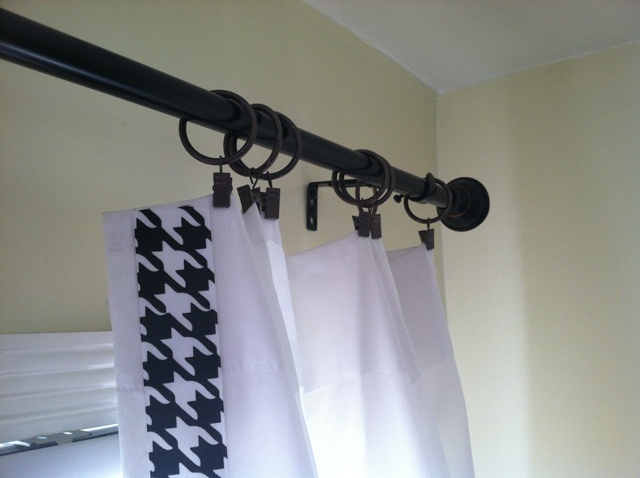 I said in this post that though I was very happy with the overall results with the living room curtains, I’d fastened the tieback hooks a bit too far out from the curtains for perfect aesthetics but was going to leave them that way unless they kept bugging me. Well, they bugged me every time I looked at them for two weeks. That meant it was time to redo them. This time around I stuck pushpins in the wall where I thought it would work and looped the tiebacks over the pins, then stepped back (what I should have done the first time) to survey the results. I made a number of small holes in the wall, but having to do 10 minutes’ worth of patching and painting this week will be worth it for finally getting the perfect placement. 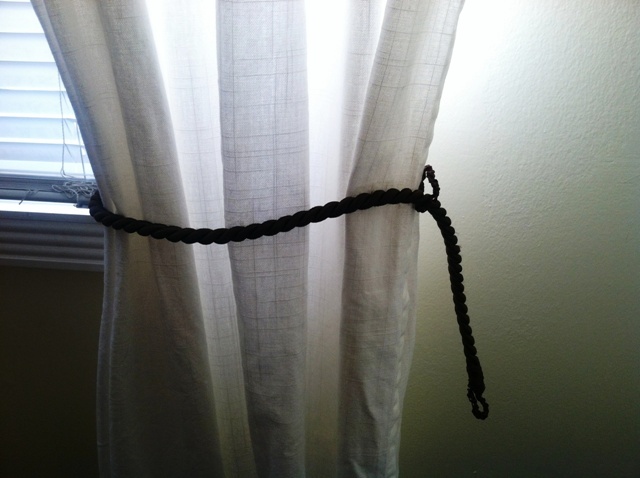 I googled it and I don’t think it’s a kosher knot, but hey, it works for me and my curtains. Know what? 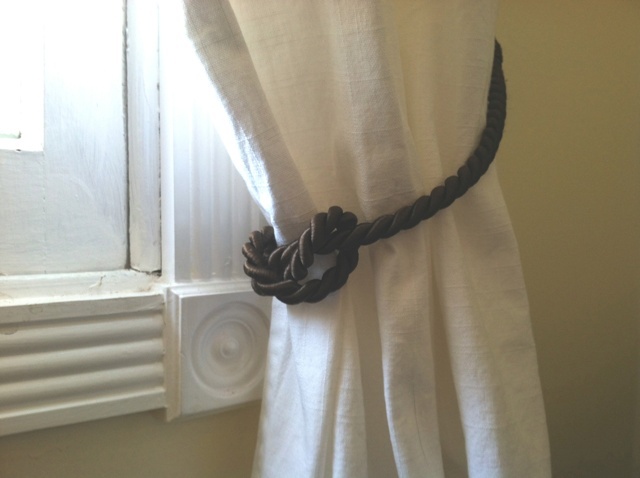 The knots make the curtains look even richer. Talk about a win/win situation. Here’s what we ended up with. 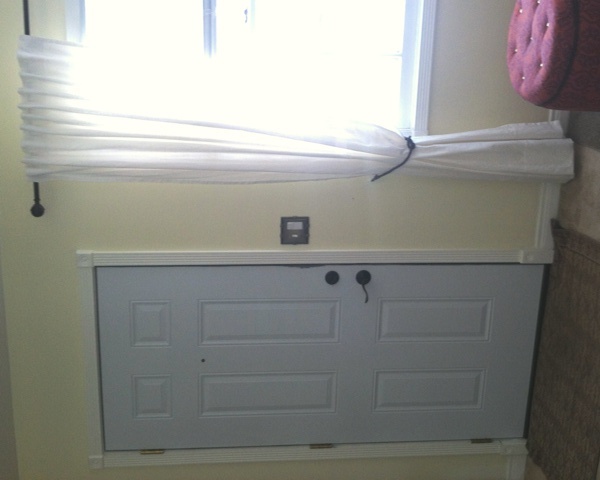 After: not only are the proportions better and the knotting more elegant, you can now see the beautiful corner block molding that the Chief installed. All in all it makes a nice detail for the room. Now for a full view. 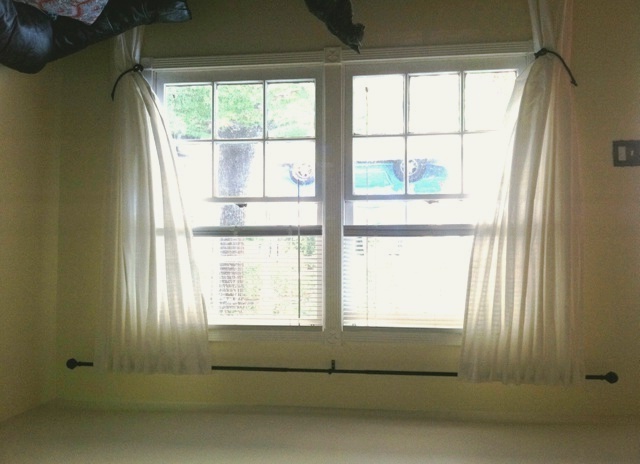 After: See how the curtain doesn’t look dragged off to the side anymore? Much better. So that really is it for this project. I’m really glad to have it crossed off the list and not bugging me any more. Does it bug you when proportions are a little off? Any little tweaks you need to get around to so that you stop noticing it every time you go by? 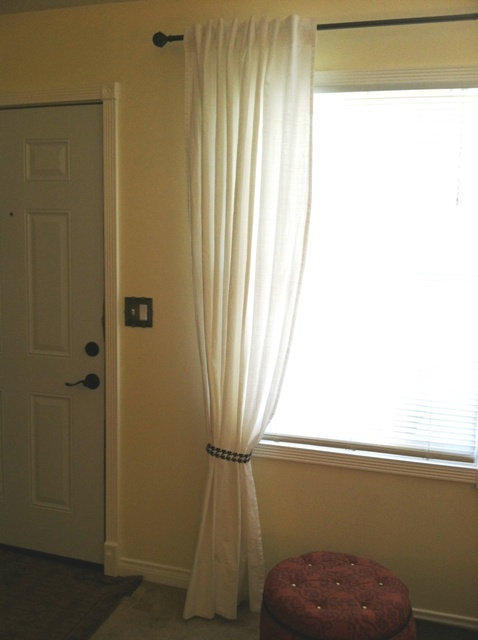 Or do you think curtains are just a hassle to get right every time? Here’s the thing. We bought 5 gallons of Behr exterior paint early this year when they had a really good rebate/sale going on. At the time I didn’t have the trace of a thought about changing the color of our house, so I mildly looked on as the Chief handed a painted-over house number to the associate so she could match it with her paint spectrometer, and we walked out with a whole lot of matching paint. We painted the new I-beam and some stained parts of the house with our new 5 gallons and discovered that that house number must have been a wee bit dirty, because the new paint was a definite shade grayer than the old cream-colored paint. No biggie. I actually liked it better that way. Gray is the new brown, you know! Oh wow, did I actually just say that…? Well… IT IS TRUE. Now, since we haven’t actually gotten around to applying the paint yet, I am thinking that maybe I should take the chance to tweak our color and I want your opinion. 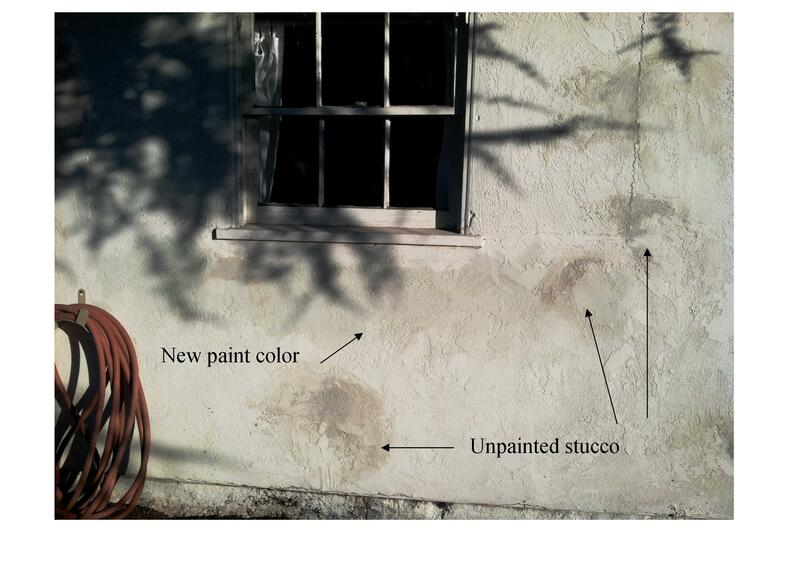 You can see from this photo what the new paint is going to look like, compared to the current color. Just a tad muddier. Our house is basically the same color as the two houses on either side of it at the present, which is another reason why a color change might be good, but it’s better than theirs because it has a black-brown roof and a bright red door :-D That is my genuine, unbiased opinion. QUESTION: I’m toying with the idea of going just a bit darker and neutral-ing out some of the yellowy cast. Should I haul the 5 gallons back to the Depot and get them to tint it? If so what should I tell them to add? Black? Brown? 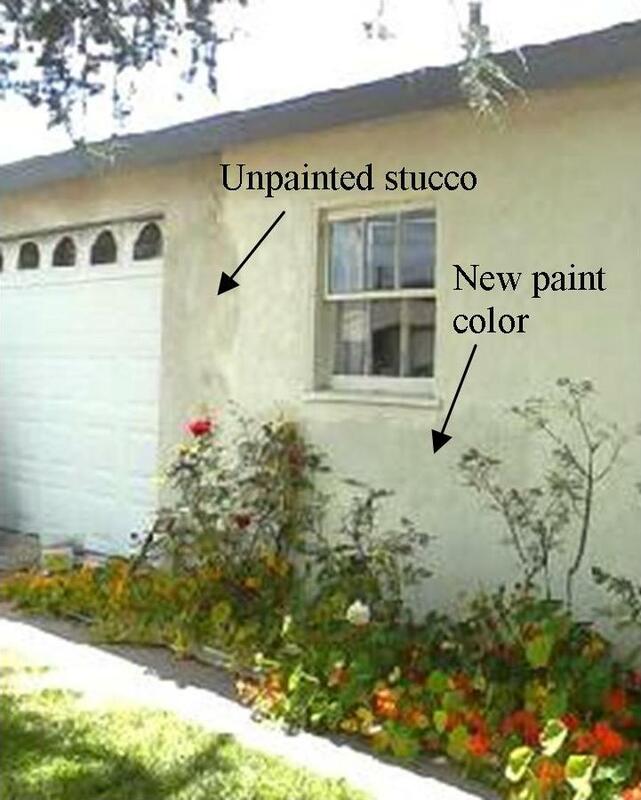 The darkest color off the paint chip that is the color I want the house to end up? How do you think this experiment would turn out? Thanks for your input! 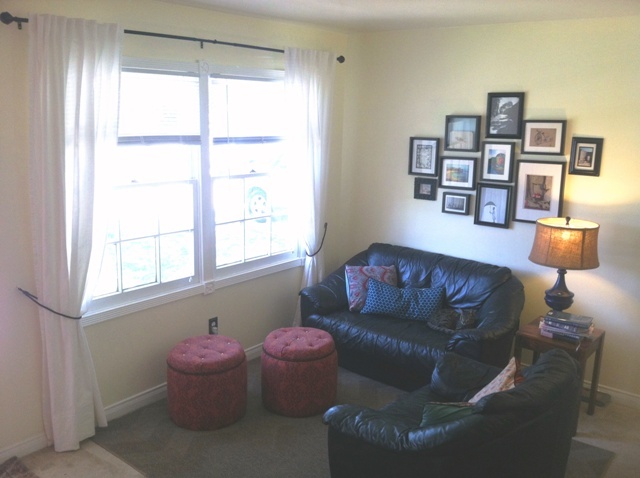 Living Room Curtains, or, How Do You Photograph Sunny Windows? Well the curtains have arrived! One day I was browsing Ikea to see what was new. 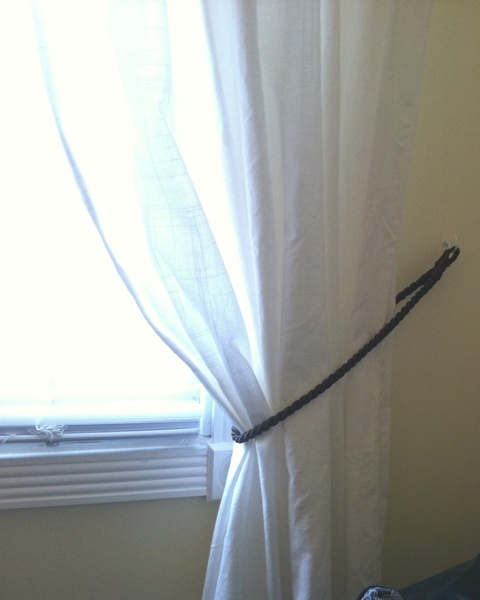 I did my habitual stop by the as-is bin on my way out and found two sets of perfect off-white curtains missing their tiebacks, one set for the living room, and one for our bedroom which needed a similar drapery upgrade. They look a bit gray in this photo, but they’re not. 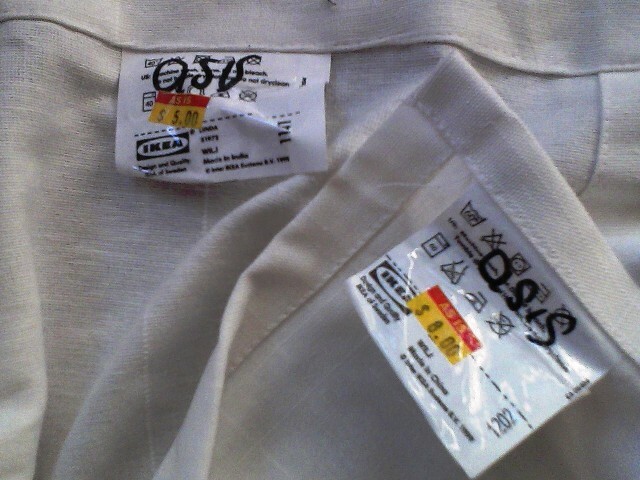 Each panel was individually priced, so the total was $16 for the living room pair (RITVA, I think) and $10 for the other (can’t find them on Ikea’s website – tab top cotton canvas with a self pinstripe every 5″). So after washing, ironing, and putting up just the first new curtain, I took a comparison shot. I am still a newbie photographer/digital editor and it is hard photographing a window straight on! – but you can see the difference. Old curtain on the right… a bit draggly and cheap looking. 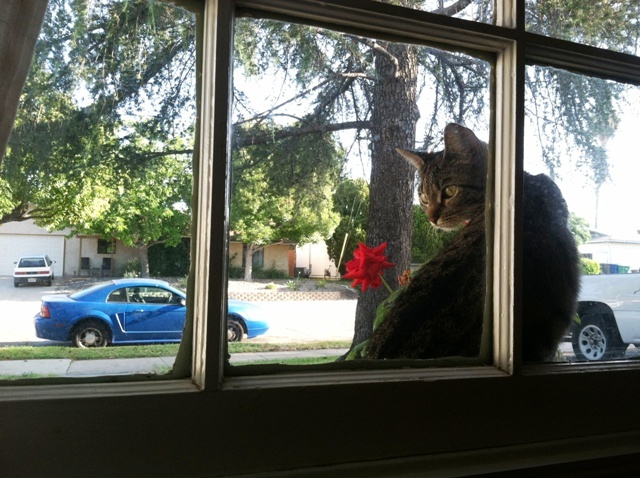 New curtain on the left… much more well behaved, proud of itself, and sleek. 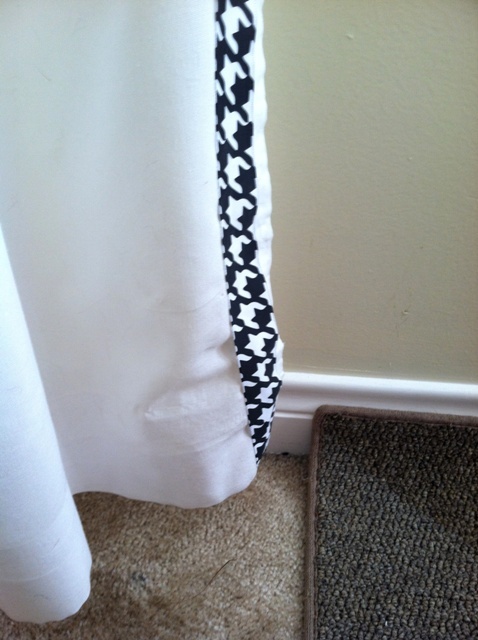 The houndstooth ribbon tieback wasn’t quite working for me because it looked flimsy and thin next to the curtain, and it’s directly next to the front door so you notice that going in and out. But I liked how its contrast brought the eye to the big picture window view, so I took some deep brown rope trim I had left over from making the drum seats and turned them into tiebacks. 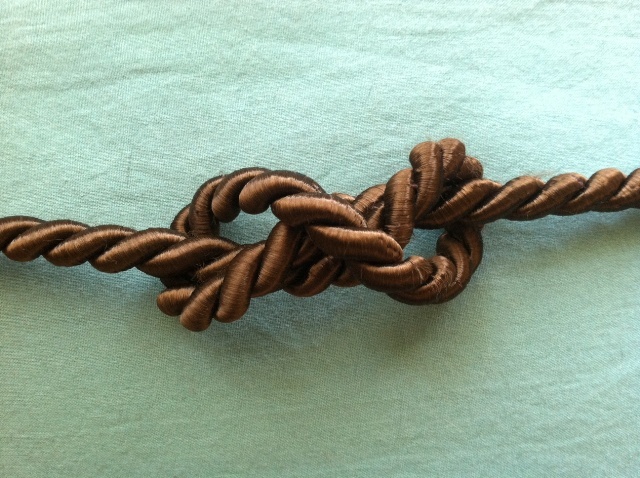 I finger-crocheted loops for the ends out of rickrack trim and hot glued rickrack around the last inch of rope. You can also see the nice weave in the cloth in this shot. Now to measure for the tieback hooks. I played with tape to hold the tiebacks to the wall so I could find the exact right spot that looked proprotionally pleasing. I like my ties down low for a French look like this (I imagine :) ) rather than a country look or the more modern no-tiebacks straight look. I could have saved myself some eyeballing by just following the rule of thirds – measuring 1/3 of the way up from the bottom of the panel and simply adjusting the measurement for tieback droop. Learn from my fail. Unfortunately I did not look at too many inspiration pictures before drilling holes in my wall for the tieback hooks (just simple white cup hooks) and I put them too far outside the curtains’ outer edges. 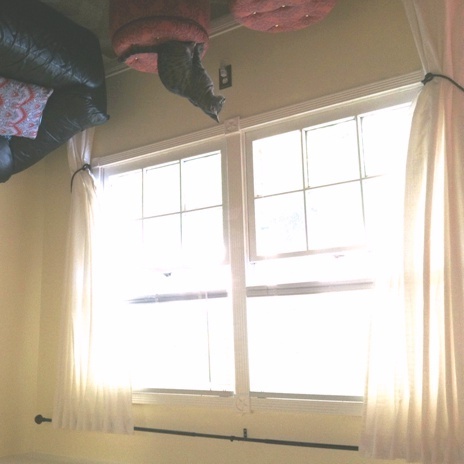 You can see in the above photo that the pros place the hooks just outside the fall line of the curtains. I’ll probably quit noticing it in a few weeks. 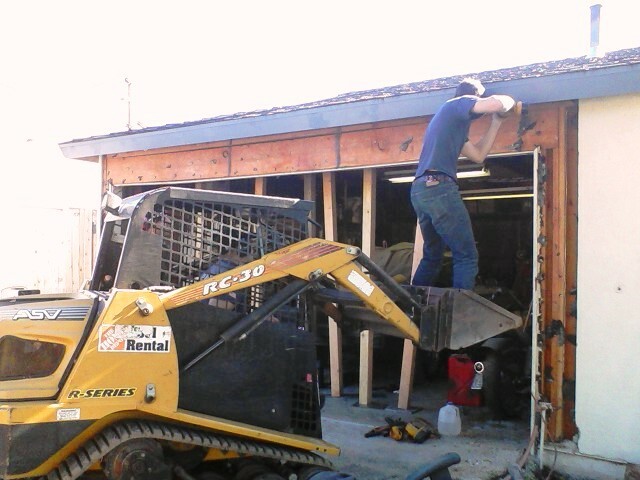 If not, I will patch the holes and redo it. C’est la vie! And here is the view they frame so well. Your turn! What is your favorite curtain (mis)adventure? 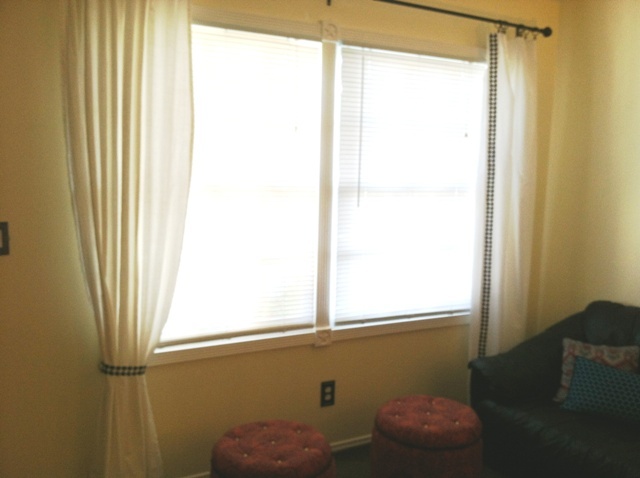 What are your preferences when it comes to window treatments? Do you like dramatic, romantic windows or does a more straightforward look suit you better? Our home is a little short on lighting, so I’ve started to keep an eye out in thrift stores for graceful lamps. There is a nagging voice in the back of my head that says I ought to have some kind of plan for what I’m looking for… but you know, I kind of enjoy the hunt and pounce method :-D We don’t have so much stuff in our house that I need to be carefully editing every addition. 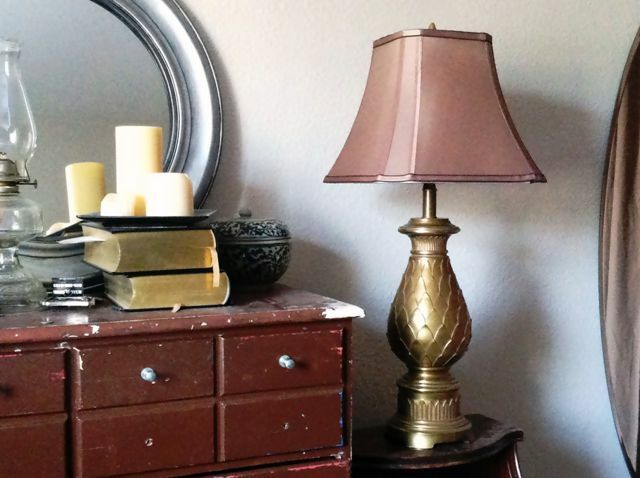 I found this great brass lamp at my local thrift store recently and it just makes me grin when I look at it. Don’t you love when that happens? I can’t even explain why I like it so much cause it’s a fairly basic, traditional lamp. 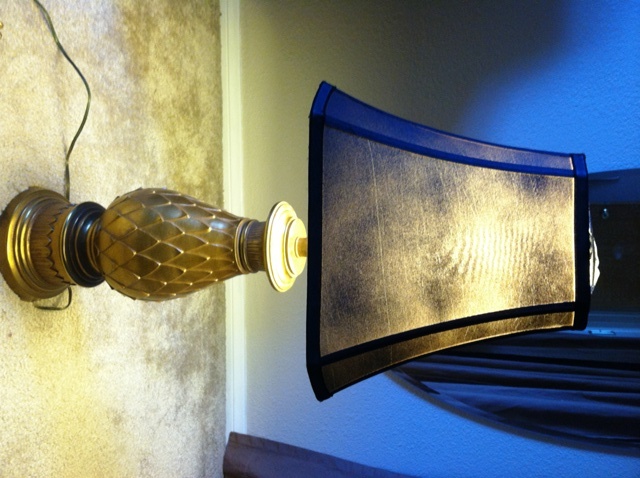 It’s a classic pineapple shape, solid heavy brass, with a great soft patina. It’s not the loud yellow shiny brass at all. I didn’t like brass anything for a long time because it was so dated, but the minute it started getting trendy again I went, wait a minute, I’m a gold girl (only color jewelry metal I wear), this is great! 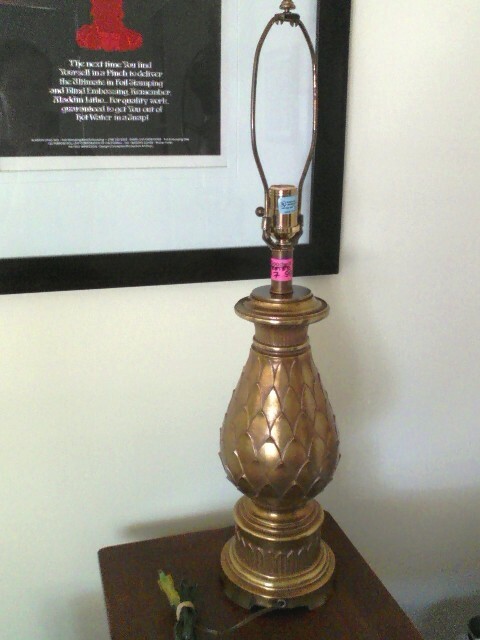 So I got me a brass lamp. $7.99! Don’t you love that kind of pricing? 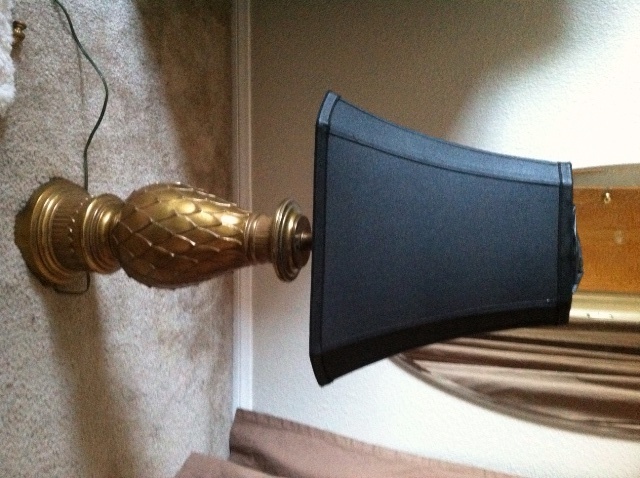 I’m thinking I’ll dress it up with a black lampshade like this lamp. The only problem is, I have no idea where I’m going to put this beauty. It’s big! 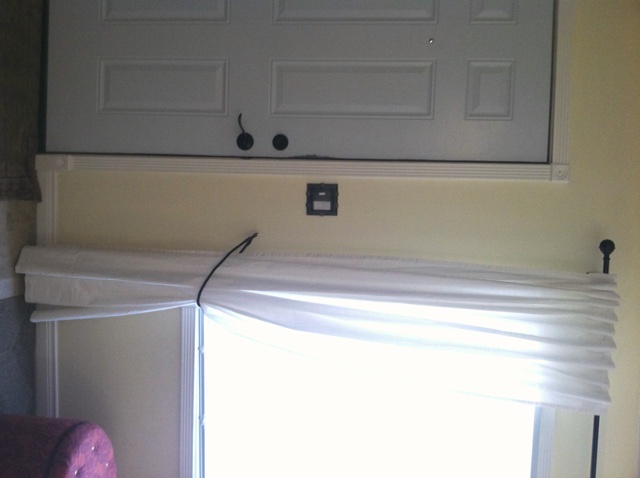 If I do a black shade on it, it should go against a light wall so it doesn’t disappear. Hmmm… still thinking. 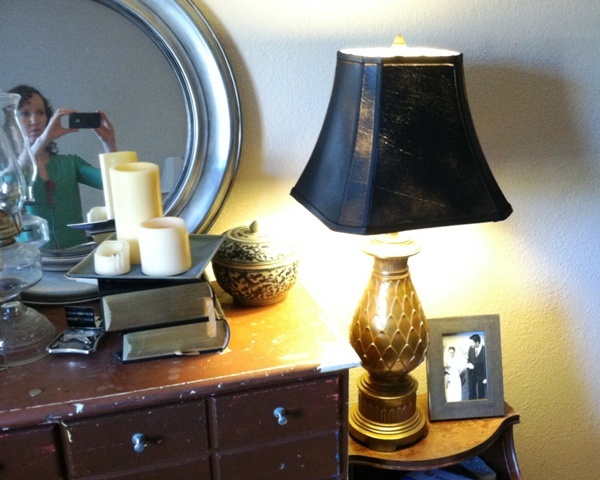 What have you found at the thrift stores or yard sales that made you happy lately?